One of the reasons that containers have become so popular is the ease of deployment, but today’s distributed applications aren’t restricted to a single runtime or a single cloud provider. If you’re using a cloud database service and serverless functions in your app, you lose the simplicity of the Docker experience for packaging an application up as a bundle and pushing it into repos for people to pull out, because you need tools like Terraform and Azure Resource Manager templates and Ansible to handle provisioning all the different components. The open source Cloud Native Application Bundle that Microsoft and Docker released at Microsoft’s Connect() developer conference Tuesday is a specification for package management that builds on the Open Container Initiative to create a manifest for distributed applications and will be supported in Docker’s public hub. “The idea is to try and define the model for how folks can build these different bundles that have a management lifecycle associated with them, so you can install them, update them and uninstall them and have all the cryptography associated with ensuring that these are secure bundles, with the ability to push and pull them and so on,” Monroy explained. CNAB’s parameterization is based on the Azure Resource Manager (ARM) template language. “This means that when you install a bundle using CNAB you can prompt for things and use strong validation on those entries right away.” — Gabe Monroy. CNAB could also simplify audit and cost control for cloud resources and address container sprawl, by making it clearer which resources are associated with which applications, making it easier for developers to adopt different services and platforms without being overwhelmed by managing them. 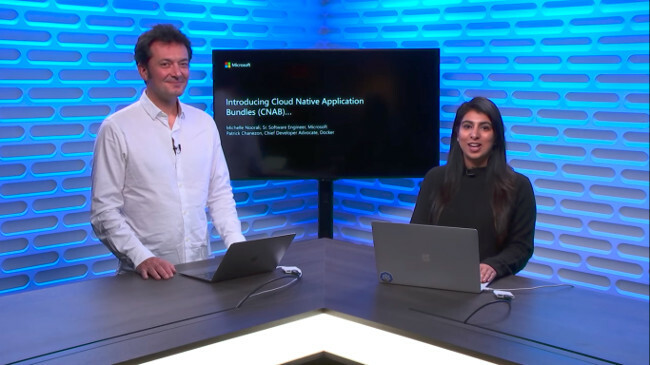 As well as the CNAB specification, Microsoft is announcing an initial set of tools, including a Visual Studio Code extension for building CNAB bundles and Duffle, a cross-platform open source reference implementation of a CNAB client. That’s a Docker-style CLI tool to create bundles, cryptographically sign and verify bundles, and push and pull the bundles to install, upgrade and uninstall them. There’s also a cross-platform Electron installer that puts a graphical front end onto CNAB bundles for installing, upgrading or installing applications. That interface relies on the parameter validation done in CNAB, the specification is flexible enough to allow install and manage desktop resources as well, opening up interesting possibilities for local app installation.